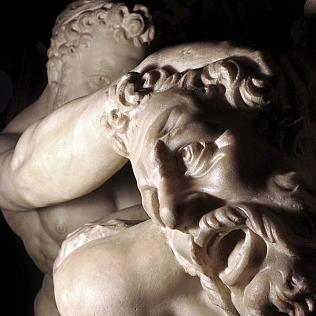 Hercules and Nessus is the sculpted group that receives visitors when they arrive at the Uffizi Gallery. In fact, the sculpture is in the first corridor since 1595. The artwork has a very particular story. It is the result of an extraordinary restoration by Giovanni Caccini (1556-1613). He is the author – among other things – of some sculptures on the Santa Trinita bridge, and of the choir and the ciborium of the Santo Spirito church. The sculpture was of the Roman Age, but it was so much damaged during the time that in the 16th century only the torso of the centaur and the base remained. It seems that a first intervention took place in Rome, but Caccini realized a real fusion between ancient style and Modern “Maniera”. He reconstructed the artwork very faithfully only with the left fragments, and so it can arrive to us. Since the end of the 16th century the group stays in its position, receiving visitors at the Gallery. The myth tells that Hercules asked the centaur for helping him and his wife to ford a river, but Nessus tried to kidnap the woman. The demigod killed the monster, but Nessus could give a magical clothing to the woman. This clothing – through several vicissitudes – caused the death of the couple. We meet Nessus also in Dante’s Inferno. In the last months, the sculpted group has been restored by Paola Rosa, thanks to the patronage of the “Friends of the Uffizi Gallery” association. During the restoration it has been possible to pinpoint exactly the integrations made on the artwork. Restores also found that, originally, the centaur stayed in a less pressed position and that Caccini worked deeply on the Hercules’ foot – despite of what they though till today. The work on the group was very important for Caccini, a respected sculptor working for the Medici family, that called him for other restorations. At the same time, the petrographic analysis by Marcello Spampinato showed that the ancient marbles are from Asia, while Caccini used Carrara marble. The restoration of this group is part of a bigger process of revaluation of the sculptures in the Uffizi Gallery that is taking place in these years, with a large and positive response by the public.